Sergeant Ashley Freyling at the PCYC stall, Caboolture. Young people at risk are the beneficiaries of a special relationship between Piñata Farms and Caboolture's Police-Citizens Youth Club (PCYC). 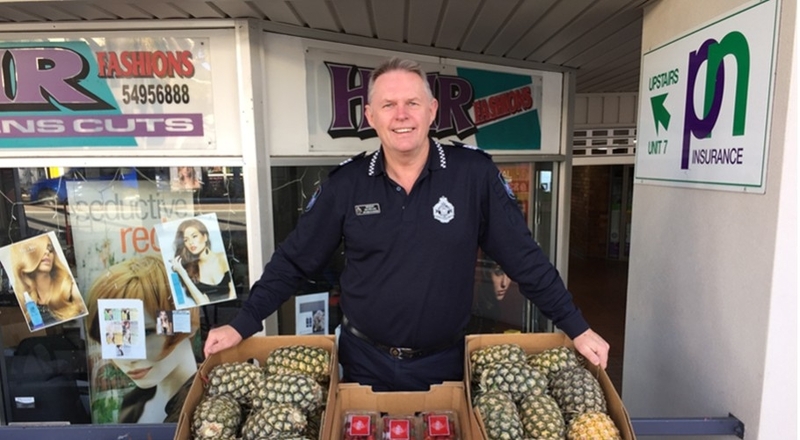 Every Wednesday, Caboolture PCYC branch manager Sergeant Ashley Freyling visits Piñata's Wamuran farm to collect a special donation – a few trays of freshly picked seasonal produce which is sold to the public the following morning at a street stall in King Street, Caboolture. Funds raised go towards the many programmes run at the PCYC to support and nurture at-risk young people from the Moreton Bay region. "What Piñata Farms does for the PCYC is fantastic. We receive pineapples all year and strawberries and Honey Gold mangoes when they are in season. Piñata produce is very popular and always the first to go!" Sgt Freyling says. The stall, runs from 8am to 1pm outside Caboolture Square shopping centre every Thursday and features produce donated from local fruit shops and other farms in the area. Some of the stall's most frequent patrons include residents of a nearby retirement home who look forward to buying farm-fresh produce, Sgt Freyling says. Established in 1989, Caboolture PCYC programmes include Deep Blue Line, which aims to enhance young people's positive sense of self, boost self-esteem, provide a variety of positive life experiences, encourage goal-setting and expose participants to positive female and male role models and, Girls United, which aims to equip young women with coping strategies for many life situations and expose participants to healthy female role models. PCYC Queensland is a not-for-profit charity that delivers a broad range of youth-focused activities and programmes, outside school hours care, gym and fitness, and more. It has 56 branches throughout Queensland. Piñata Farms has been supporting the PCYC since 2015.